A revised planning application (no. 20180421) has been submitted by Manchester-based Northhold Group for a small supermarket on the former Reepham Motors site on School Road. 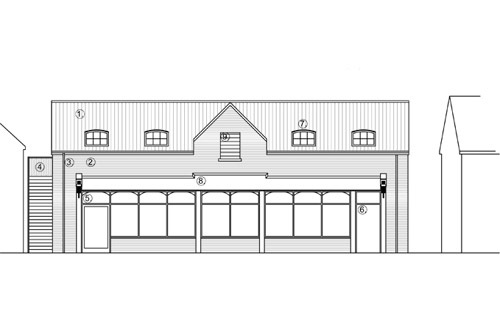 The plans call for the demolition of the existing garage/depot and the erection of a A1 retail convenience store to the operated by the Co-operative Group. This replaces an earlier planning application made to Broadland District Council, which was withdrawn at the end of December following initial feedback. According to the planning and retail statement, amendments have been made to the form and appearance of the proposed building, although the nature, scale and content of the original proposal remains largely unchanged. The building would be two-storeys in height with a crown roof and a ridge equal to, or slightly lower than, the adjoining buildings. The site would be screened by new 2.4-metre-high close-boarded fences to the sides and rear. The proposed retail unit would be operated as a Co-op local convenience store, with a ground-floor sales area of no more than 280 m2 and six parking spaces, including provision for disabled customers. The store would open seven days a week from 7 am – 11 pm and employ around 10 full-time and 10 part-time employees. A premises license has already been submitted for the School Road site. Reepham currently has a small convenience store – the Spar on Ollands Road – which has a sales area of less than 140 m2, a limited product offering, no dedicated parking or delivery areas, and an “unsightly” frontage, the Co-op’s agent points out. It adds that, “if the balance of trade were to shift [from the Spar shop], there is unlikely to be an adverse effect on the [town] centre as a whole”, further suggesting that Reepham’s existing independent shops would “remain vital and viable” alongside a small supermarket, and resulting in the need for fewer trips to large food-stores in Norwich and nearby towns. View all the documents relating to planning application no. 20180421 on Broadland District Council’s Planning Explorer.